Roger Clemens earned a reputation as one of the toughest and hardest-throwing pitchers to ever take the mound during his 24 seasons in the league. However, even though "Rocket" won more than 350 games and notched over 4,600 strikeouts, his trip to Cooperstown is still very much in doubt. Nevertheless, as the best pitcher of his era, his trading cards remain popular and ten key options are covered below. Although mainly remembered for his stints with the Boston Red Sox and New York Yankees, Clemens' two best statistical seasons were with the Toronto Blue Jays. In 1997 and 1998, he won the pitching Triple Crown with the Jays by leading the American League in wins, ERA, and strikeouts. A winner of a record seven Cy Young Awards, Clemens seemed to get better with age which led some to assume his use of performance enhancing drugs. Clemens has never admitted using steroids and as Hall of Fame voters have increasingly supported Clemens bid each year of his eligibility, he may someday get his own plaque in Cooperstown. 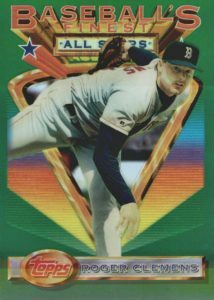 Shop for Professionally Graded Roger Clemens cards on eBay. While Clemens signed autographs for many different products during his playing days, each appearance was typically very limited. Red Sox fans can look to one of his first certified autographs in 1996 Leaf Signature as the autograph to own from that era. Blue Jays collectors can visit the legendary Donruss Signature sets from 1997 and 1998 for other popular on-card options. Yankees fans have several choices for autographs including the 2001 Upper Deck Legends and 2003 SP Authentic sets. More recent releases featuring Clemens autographs and relics are available in 2016 Topps Finest and 2016 Panini Flawless. 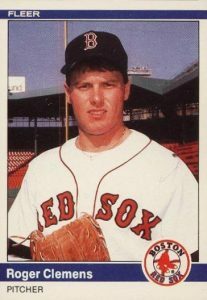 Roger Clemens is certainly among the most qualified Hall of Fame candidates that voters have refused to elect because of the shadow of steroid use. Yet, Clemens' amazing performances make him popular with two huge fan bases—the Red Sox and Yankees. In trying to balance those two points, this list was comprised using card value as the main component, along with set design and card availability on the secondary market. Clemens' 1986 Topps card was part of the last year that Topps Tiffany was truly limited. Only 5,000 sets are estimated to have been produced and they were made exclusively available to hobby dealers. The cards themselves came in specially designed boxes and were given the title of "Collector's Edition" as the name "Tiffany" was not used officially by Topps. However, the term became commonly used for the glossy, high-end sets by hobbyists who enjoyed the quality cards. The Crusade insert set was spread out through three Donruss releases in 1998 with 40 cards available in 1998 Donruss, 30 cards in 1998 Leaf, and 30 cards in 1998 Donruss Update. These 100 cards were Donruss' answer to the Topps Finest Refractors and collectors could find the regular version along with purple and red parallels. Scarcity ranges from 250 copies for the regular version, 100 copies for the purple, and 25 for the red parallel. Each box of 1993 Finest featured a topper of an oversized All-Stars card from the regular set. 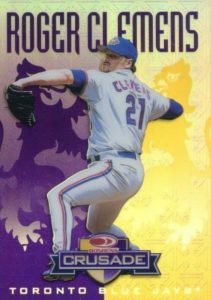 The Clemens card has a regular edition, oversized topper, and Refractor version to find with the Refractor, of course, being the most sought-after by collectors. A single Refractor card was found in every nine packs and they were sometimes overlooked as there was nothing identifying the card except the slightly more shiny front. Clemens' 1991 Topps card offers one of the most iconic images from the set as he stands next to the "SRIKE OUT" portion of Fenway Park's Green Monster scoreboard. Clemens was the king of strikeouts for the Red Sox and he is still the team's all-time leader with 2,590 strikeouts in his 13 seasons, along with a team-record 192 wins. The most in-demand cards from 1991 Topps are the gold-stamped Desert Shield versions that were made available to soldiers in Kuwait and at military commissaries with about 6,800 copies available. The early certified autograph appearances for Clemens in 1996 Leaf Signature and Donruss Signature are too limited to be included on this list. Instead we turn to an excellent Clemens on-card autograph found in 2002 Upper Deck Ultimate Collection. Collectors can locate several color variations of the Ultimate Signatures insert and Clemens is featured as a Yankee following his only Cy Young-winning season with the team in 2001. Clemens' signature often runs together with the autograph being dominated by the oversized "R", "Cl", and "S" letters. The Pawtucket Red Sox are the AAA team in Boston's farm system. 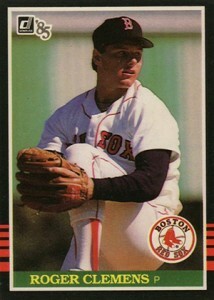 Clemens briefly played for Pawtucket for seven games before debuting on the Red Sox's MLB rotation in May. The 1984 Pawtucket team set, famous for Clemens' pre-rookie card, was produced by TCMA, a card company known for its retro and minor league card sets in the 1970s and 1980s. The abbreviation TCMA stands for the names of founders of the company, Tom Collier and Michael Aronstein. 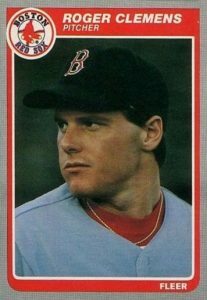 As we enter the final four cards, we must address the debate surrounding what is and isn't a Roger Clemens rookie card. Many sellers on auction websites will attach the "rookie card" label to the first Clemens appearance in the flagship sets for Fleer (featured below), Donruss, and Topps. However, for simplicity's sake, I will not include the "RC" label for those appearances on this list. 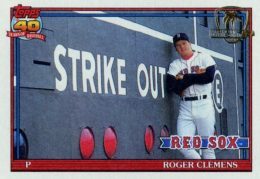 It certainly seems that Clemens' appearance in 1985 Fleer shouldn't be given the RC moniker as he was featured in the Update set of the previous year. For a second appearance, it still does extremely well and is one of the most valuable cards in the product. 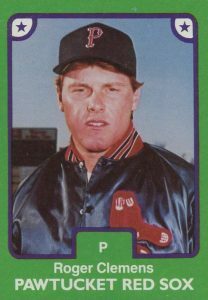 While the rest of the early Roger Clemens cards from 1984 and 1985 feature him in portraits photos, his 1985 Donruss card shows him about to deliver a smoking fastball. Given his steady performance for most of his career, many people don't know that he underwent shoulder surgery in 1985. He was one of the first athletes operated on by Dr. James Andrews, who would become famous for his career-saving operations for many notable athletes. Whether it is considered a rookie card or not, the first appearance by a potential Baseball Hall of Fame member in a Topps set typically brings big bucks. That is even more true for Topps Tiffany as the high-gloss version is certainly the most pursued edition of Clemens' Topps debut card. The print run is estimated at just 5,000 complete sets which is the same rate as the 1986 set. Mint graded copies can approach $200 at auction with gem mint copies reaching many times that amount. The unquestioned king of the Roger Clemens rookie card sweepstakes is his appearance in 1984 Fleer Update. This was Fleer's first Update set that mirrored the Topps Traded configuration by including rookies and players who had been traded during the season. Fleer struck gold by offering the first major league cards for both Clemens and Kirby Puckett in the set. Configured and sold as one complete set in hobby shops, the update product was never available in individual packs which led to the belief that other cards should also be considered Clemens' rookie. No matter which side of the argument you fall on, it is hard to question that this is the top card for Clemens as gem mint copies command $500+ at auction. 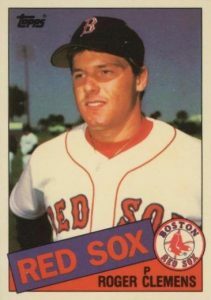 1985 Fleer Roger Clemens Baseball Card Rookie #155 Red Sox Pitcher Mid-Grade? 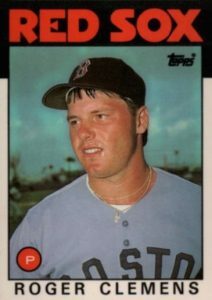 1986 Topps Roger Clemens #661 Baseball Card. 1987 TOPPS ROGER CLEMENS GALLERY OF CHAMPIONS STERLING SILVER NICE !